The back of the box says “while similar to a simple pizza, this fabulous, fascinating flatbread defines a category of its very own.” Agreed. While living in Europe, even the worst pizzeria often put out a product superior to a lot of US pizzas; on those nights when I didn’t feel like going on, European frozen pizzas, especially those from Italy and France, more than satisfied my peculiarly picky palate. I often thought, “why can’t we get frozen pizza like this at home?” Now we can. As I have previously reviewed two of Trader Joe’s frozen offerings, the mushroom ‘tarte’, and the Pizza Olympiad, when I saw this “Wild Mushroom and Black Truffle Flatbread” yesterday, I knew it was destined for my oven last night. (Note, Trader Joe’s is a smallish nationwide specialty grocer, to find locations click here). And again, we agree. Bake at 425 for 6-8 minutes, and this 9 oz pie becomes a hearty entree or an appetizer for several people. 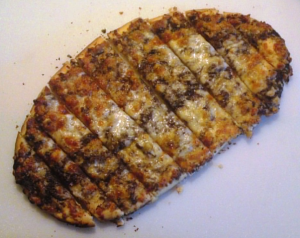 The flatbread is crispy, and the flavors of the mushrooms, truffle sauce, and cheese come through brilliantly! I’m fortunate to live in a city where there are several Trader Joe’s – first encountered in Los Angeles, and at least once a week I am in there to pick up their flavored sparkling waters and juices for Mrs. Burgerdogboy, as she has a penchant for them, and it gives me an excuse to peruse the “what’s new” products in their aisles. I only picked up this one item for myself yesterday, but noted there were several more pies that I haven’t tried. Looks like another trip is in order! As I said in one of my previous posts, on the @worstpizza.com scale of 0-8 slices, 8 being best, I rarely give a “7″, but I did for Traders Joe’s frozen, and that surprised even me. I put this one in the same category!